1 » While the suicidal hijacking of four commercial airliners happened 5,000 miles away, the impact on Hawaii is immediate and devastating, with news of layoffs, consolidation and cutbacks dominating local headlines since Sept. 11. The attacks on the World Trade Center and the Pentagon shut the nation's airports -- Hawaii's economic lifeline -- for two days. The monthly visitor count plummets 34 percent in September and 30 percent in October. 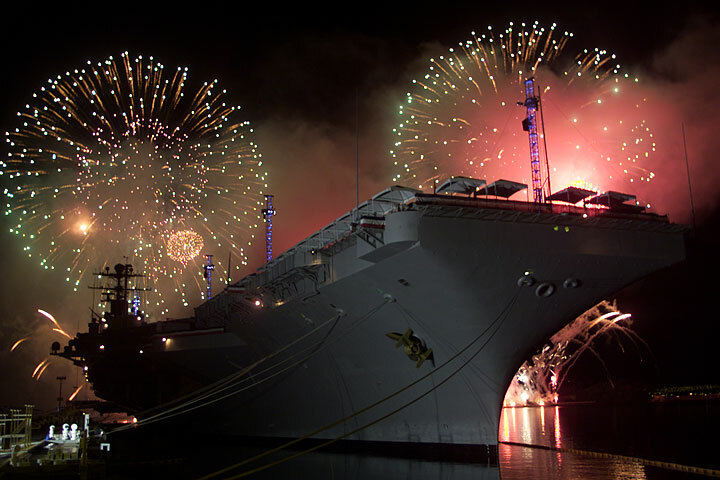 2 » The Japanese training fishing vessel Ehime Maru is hit and sunk Feb. 9 off Diamond Head by the USS Greeneville while the nuclear-powered submarine is demonstrating a rapid-surfacing drill for a group of civilian guests. The submarine's skipper, Cmdr. Scott Waddle, is reprimanded by a military court of inquiry and forced out of the Navy. He retires at full rank and pension, raising criticism in Japan that the punishment is too light. Four other crewmen also are disciplined. Honolulu Police Department officers tend to one of two officers who are shot and wounded on H-2 freeway, just north of the Ka Uka Boulevard offramp. An interfaith religious service is held at the National Cemetery of the Pacific at Punchbowl for the victims of the Sept. 11 terrorist attacks. 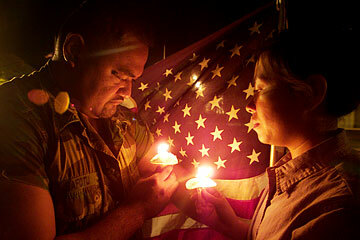 Among the crowd are Schoen Safotu and his wife, Nenny, who lit candles during the service. 4 » On July 3, Honolulu City Councilman Andy Mirikitani becomes the highest-ranking elected official in Hawaii convicted of federal felony charges while in office. He is found guilty of theft, bribery and extortion for receiving kickbacks from two aides he had given bonuses. Mirikitani retires Dec. 1, less than a week before being sentenced to four years and three months in prison. 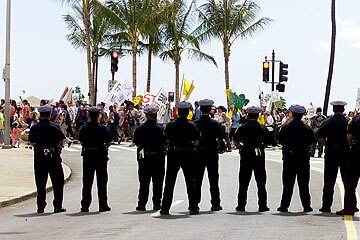 5 » The 10-campus, 45,000-student University of Hawaii system gets a new president during the summer. On July 2, Evan Dobelle succeeds Kenneth Mortimer, who had headed the university for eight years. 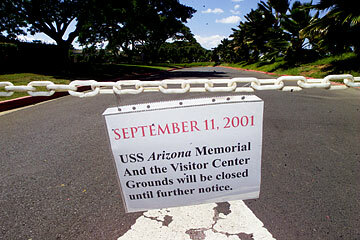 Below right, a hastily made sign notifies visitors that the Arizona Memorial is closed on the day passenger airlines plowed into the World Trade Center and the Pentagon. 1 » Aloha and Hawaiian airlines announce they will combine into Aloha Holdings. Greg Brenneman, former president and chief operating officer of Continental Airlines, will take a 20 percent stake in the new firm and assume the titles of chairman and chief executive. 2 » Paris-based BNP Paribas SA announces in May that it will buy out the parent of First Hawaiian Bank in a $2.5 billion deal. BNP, which acquired a 45 percent stake in First Hawaiian's parent in 1998, had been released from a three-year lockdown from buying more shares. 3 » Federated Department Stores Inc. of Cincinnati buys 151-year-old Liberty House for $200 million and later converts the stores to Macy's. 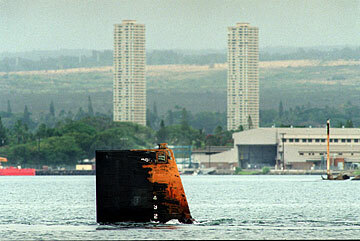 It is in the process of firing more than 370 Hawaii employees. Liberty House lost sales from the weakening of Asian tourism to Hawaii in the late 1990s. 4 » Domestic visitor counts cumulatively fall 20 percent during September, October and November from the same period a year earlier, while international arrivals plummet by nearly half. Arrivals for January through August had been down just 1 percent overall from 2000, which was a record year for Hawaii tourism. 5 » Perhaps the award for the year's biggest nonstory goes to the annual conference of the Asian Development Bank, held in May at the Hawai'i Convention Center. Following anti-globalization riots in Seattle, the Honolulu Police Department spends $3 million and 10 months to get ready for the meeting. State agencies report paying $846,094 for security and related expenses. But all the measures must have had their desired effect, because nothing bad happened. 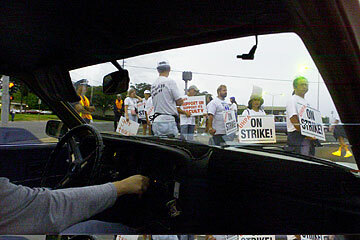 Striking University of Hawaii faculty members manage to slow traffic to the Stan Sheriff Center, where the men's volleyball team was playing an exhibition game. 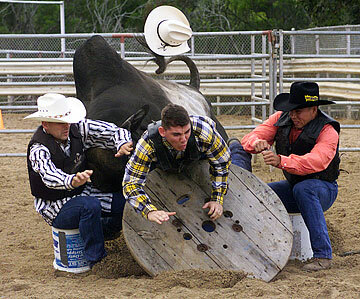 1 » June Jones crashes on H-1 Feb. 22, leaving folks holding their breath as he fights back from the brink of death. While he lies in a hospital bed recovering from a wreck that reaches all levels of his life, Jones' football team makes a solemn promise to get better. 2 » Cal Lee retires at Saint Louis School, which leaves the speculation door wide open at UH. Jones is not one to talk about the hypothetical, but it seems unlikely that Lee will be sidelined for long. His retirement party is crashed by the Kahuku Red Raiders, who prove that a power shift toward the North Shore has been made in high school football. 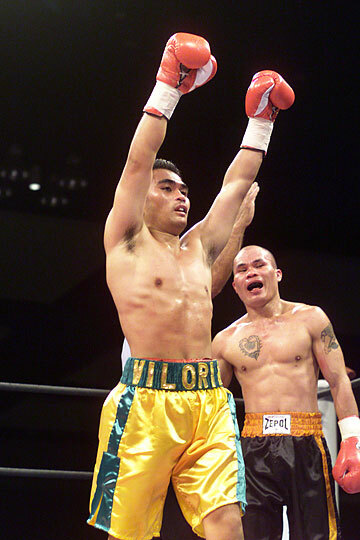 Brian Villoria raises his hands in victory after defeating Ben Jun Escobia in his professional boxing debut. 3 » UH hires Mike Trapasso as baseball coach. Meanwhile, the fathers of UH make a wise decision in naming the stadium after coach Les Murakami. His dream was always to go back to the College World Series; perhaps he can live that moment through Trapasso. 4 » Hawaii's basketball team advances to the NCAA Tournament by winning the WAC championship during the madness of March. Coach Riley Wallace manages to do it with a collection of players flung far and wide, using a little sports psychology along the way. 5 » Damien decides not to play Saint Louis in football, a decision that brings about a restructuring in the ILH. Might it lead to classification in all of high school sports somewhere down the road? 1 » Honolulu sees few memorable big concerts in 2001, but two are world-class: Elton John returns to Blaisdell Arena in January with a group that included old-time band members Nigel Olsson and Davey Johnstone, and Destiny's Child proves to be better than Britney when the trio plays a steamy one-nighter in the Arena in September. 2 » Honolulu has two fiercely competitive Jawaiian/"island music" radio stations, but Hawaiian traditionalists dominate the 24th Na Hoku Hanohano Awards in May. 'Ale'a wins four Hokus, including "Group of the Year." Darlene Ahuna, Led Kaapana and Ku'uipo Kumukahi represent traditional Hawaiian music with wins in other major categories. 3 » DisGuyz write and record "Our Nation In Song" the night of the Sept. 11 attacks and has it on local radio and TV stations the next morning. Proceeds from the CD-single are donated to victim-related charities. John Kolivas debuts the Honolulu Jazz Quartet with "Remembrance," with proceeds going to WTC victims and survivors. And Matt Catingub introduces "In Memory" as his contribution to the healing process during the Honolulu Symphony's first "Pops" concert in October. 4 » Genoa Keawe and the Haili Church Choir are inducted into the Hawaiian Music Hall of Fame and honored with a concert at Kawaiaha'o Church. Johnny Kai's Hawaii Music Awards are postponed, then canceled in Sept. 11's aftermath. 5 » Israel "IZ" Kamakawiwo'ole becomes one of few local recording artists to make one of Billboard's major record charts when "Alone in IZ World" appears on the pop albums chart. Producer Jon de Mello scores a local first by persuading more than 40 Hawaii radio stations to play IZ's recording of "Mona Lisa" simultaneously on Sept. 7.